The Ministry of Truth floats in the air above the Temple Canton. The Ministry of Truth floats above the Temple Canton. Actually a small moonlet from Oblivion called Baar Dau, this celestial object is said to have been stopped in its fall toward the city of Vivec by Lord Vivec himself, who brought it to rest above the Temple Canton, where it has hovered ever since. 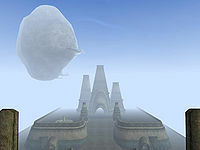 Although the moonlet looks quite majestic hovering sedately above the city, local legend maintains that, should the populace cease to worship Vivec, the moonlet will complete its fall and raze the city. 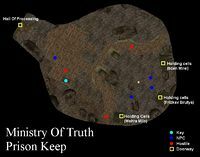 The Temple has dug many tunnels and chambers into the moonlet and converted it into a maximum security prison for dissidents and religious criminals, the term being vague and hence being open to interpretation, allowing various people to be imprisoned. The security of the Ministry is obvious to any who see it; the only way to and from the moonlet is by flight. During the Main Quest you will attempt to rescue Mehra Milo from here. 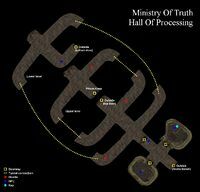 The entrance and various inside doors are locked and heavily guarded by Ordinators, most of them hostile. Unlike most ordinators, however, they will not only not turn hostile if you're wearing Ordinator armor, but will also let you pass, their Fight is not too high. There are a few others on whom different methods can be used to avoid bloodshed. If you are an Adept or higher in the Temple hierarchy, the guards will warn you to leave the first time you talk to them, and become hostile on the second (in which case all guards in the area will attack you on sight). 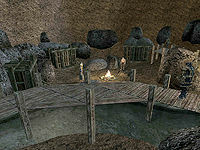 If you have the Morrowind Patch Project installed and are the Patriarch of the Temple, they will protest the irregularity of your demands for access to the Ministry, but will nevertheless comply, giving you directions to people in charge with the keys and warning you about the hostile guards. Mehra Milo and the Lost Prophecies: Find Mehra Milo in Vivec. This page was last modified on 8 September 2018, at 04:14.